Apex Legends’ popularity seems unflagging. A new initiative backed by T1 Entertainment and Sports and FACEIT will now offer competitive-minded players more options to compete on a professional level. Behold, for another instalment in competitive Apex Legends is fast approaching. Scheduled for March 30, the Invitational hosted by T1 Entertainment and Sports and FACEIT will feature a $25,000 prize pool. A total of 20 teams are invited to join the competitive fray with the action streamed out to the world via Twitch. There have already been invitations sent out, with Cody “Dizzy” Meadows from NRG Esports asked to put together a team and join. The event will be broadcast on both T1 an FACEIT’s dedicated Twitch channels. FACEIT have been actively involved with hosting events across multiple shooters, including PlayerUnknown’s Battlegrounds and Counter-Strike: Global Offensive. The first participant in the T1 x FACEIT Apex Legends Invitational is… ? @Dizzy! Meanwhile, a qualifying event for the Apex Legends Invitational is already under way, with teams competing between March 18 and March 29 before joining the final showdown on March 30 and having a shot at the $25,000 prize pool. Apex Legends is one of the most popular games in the world right now. The battle royale genre has truly set the gaming world alight and we’re thrilled to keep playing a part in the development of the competitive community. Apex Legends made an absolute splash when the game reared its head in February. It was a killer entry managing to amass more viewers than Fortnite’s, the result of skillful marketing campaigns. Tom Wijman from Newzoo called Apex Legends’ announcement one of the “best orchestrated game launches” the world has ever seen and he had a point. To this day, Newzoo continue to examine the game’s lasting popularity and juxtapose it with that of another phenomenon – Fortnite. Part of the game’s success is the fact that a lot of Fortnite players, including Tyler “Ninja” Blevins and Michael “Shroud” Grzesiek started streaming the minute the game came out. According to Reuters, EA offered Ninja $1 million to stream the game, which is partly why the game continues to top all charts when it comes to player base and viewership. Apex Legends experienced an overwhelming boom with over 50 million people joining to play during the first month, Roundhill Investments said. The game had outpaced Fortnite’s own popularity and player acquisition rate – an important gauge. Nobody has really though that Fortnite’s popularity can be eclipsed by a contender that has come from the least threatening company. The FACEIT and T1 Apex Legends Invitational will be a continuation of the efforts to build up the game’s popularity and its rightful place as a competitive product. 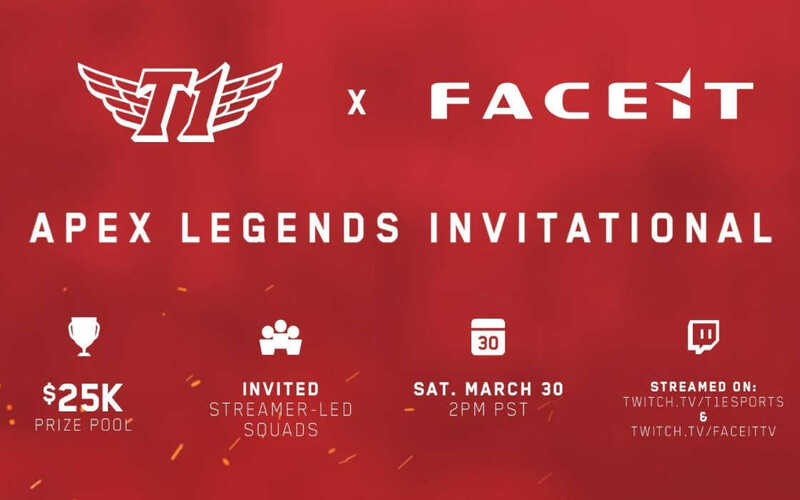 The T1 and FACEIT are teaming up to introduce the Apex Legends Invitational on March 30, 2019. The event will feature 20 teams and $25,000 in prize money.